On Thanksgiving, people across the country will be getting together to eat more than 700 million pounds of turkey. This much turkey means that there will be a lot of food preparation and cooking done in the couple days leading up to Thanksgiving. As you start preparing your Thanksgiving meal, it is very important to use good practices for food safety and cooking safety to avoid fires. Cooking is always the number one cause of house fires and cooking related fires tend to increase over major holidays such as Thanksgiving. Food safety should also be a top concern to make sure you are handling and cooking food properly and serving meals that are safe for your guests. Before you begin preparing your Thanksgiving meal, review these food safety and cooking safety tips to ensure a safe and happy holiday celebration. Preparing a turkey involves several steps and because consuming raw or under-cooked turkey can lead to food-borne illness, it is important to follow these food safety precautions during each step. 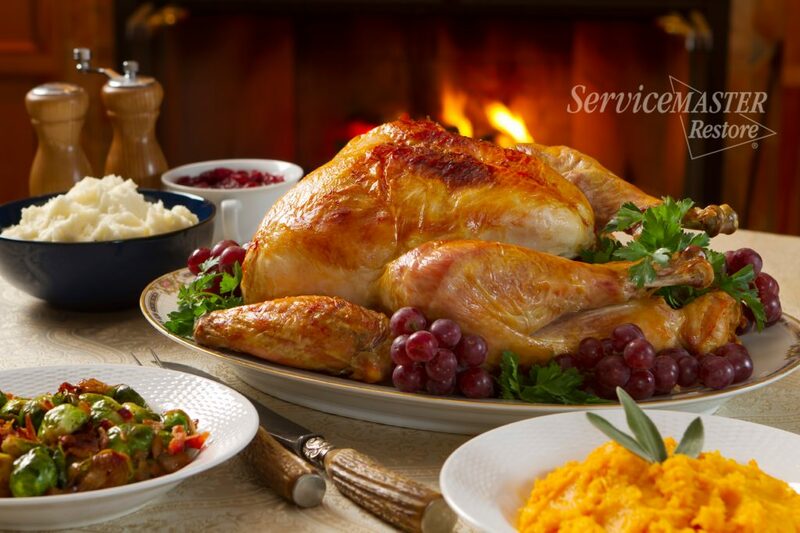 ♦ Thawing: If you buy a frozen turkey, buy it early so there is enough time for it to fully defrost before cooking. The most effective ways to thaw a turkey include placing it in cold water in the sink, using the microwave, or leaving it in the refrigerator. Do not let your turkey thaw on the counter. If you are deep frying your turkey, it must be completely defrosted. Deep frying a partially thawed or frozen turkey is very dangerous. ♦ Preparation: When preparing your turkey for the oven, make sure you prepare it in a separate area of the kitchen than other food to avoid cross contamination. Do not use the same knives or utensils on vegetables or other food that you use on the turkey and make sure you wash your hands and utensils thoroughly afterwards. ♦ Stuffing: Cook the stuffing separately before putting it in the turkey to avoid under-cooked stuffing. Do not put stuffing in the turkey if you are deep frying it because it won’t cook correctly. ♦ Cooking: Cooking the turkey thoroughly will eliminate the risk of food-borne illnesses. Make sure you cook it to an internal temperature of 165 degrees for white meat and 180 degrees for dark meat. ♦ Check your smoke alarms before you begin cooking and change the batteries if necessary. ♦ Turn off stove-tops and ovens if they are not in use, most cooking fires are caused by unattended cooking equipment. ♦ Stay present and awake when cooking. ♦ Put pots on the stove-top with the handles facing away from the front. This will help prevent accidentally knocking over the pots. ♦ If you are deep frying your turkey, make sure you follow these turkey frying safety tips to avoid mishaps that could lead to a fire. ♦ When using your fireplace, you should only burn wood. Make sure the fire is put out before you leave the home or go to sleep. ♦ Put flammable decorations far from fireplaces, candles, and other heat sources. ♦ Do not leave lit candles unattended. Hosting Thanksgiving dinner for your family and friends can be a fun and special experience but there are many ways that your gathering can go wrong. By following proper food safety precautions and good fire safety when cooking and decorating, you can help ensure a pleasant holiday meal. It is still possible for some mishaps to occur despite meticulous preparation. 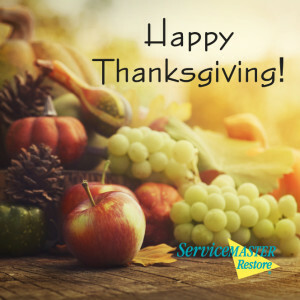 If you experience fire damage in your home over the holiday, do not hesitate to contact ServiceMaster NCR for fire damage restoration. We will be available to respond to your emergencies 24 hours a day over the holiday weekend for prompt restoration. Give us a call at (703) 212-7000 if your home in the Alexandria, VA or Washington, DC area sustains damage from a fire. Disasters don’t stop for holidays. Neither do we.